At half time of last year’s MLS Cup, things did not look good for the Colorado Rapids. FC Dallas, who was favored to win, was ahead 1-0. But the Rapids scored in the second half and extra time and won the match 2-1. It was a come from behind victory. Since the Rapids were losing at one point in the game, but won it in the end, you can say they came from behind to win the championship. 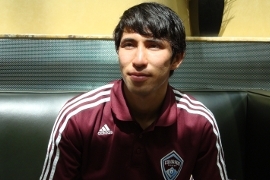 Kosuke Kimura, who plays defender for the Rapids, helped make sure his opponents didn’t score again so that his team could take the lead. Kosuke is the only Japanese player in MLS. When he first came to the US, he knew almost no English, but he worked hard and learned quickly. We recently met with him to discuss how he learned English and how his team was able to come from behind and win the MLS Cup. Jason: Welcome to English, baby! I am here with Kosuke Kimura. You are the only Japanese player in Major League Soccer. Is that right? Jason: Can you tell us about when you learned English? Kosuke: I mean, when I was in my country, we study English at school but it’s like only the basics. We don’t really use English to communicate with people. It’s just like typical A-B-C, or “This is a pen,” or just the basic grammar and all that. So I never really used it before, till I came to this country, and obviously when I came here, 18 years old, I think, I couldn’t speak any English whatsoever. So my coach from the soccer team, he told me, “Kosuke, you know what? If you wanna make my team, you cannot talk to any Japanese people. You have to use English.” And he goes, “If I see you using Japanese, you’ll be in trouble.” I’m not gonna lie, that was a tough time because I knew I had to do this. I had no choice. I want to play soccer. I want to learn English, and I want to study what I want to study. And English is the first thing you have to do. Jason: The Colorado Rapids won the MLS Cup last year. And there was a come from behind victory. Can you talk about that phrase, “come from behind”? Kosuke: 1-0 we are losing, and usually, I’m not going to lie, when you consider one goal, we don’t really catch up and win the game, especially last year. We’d never done that, and here comes the final. They scored a goal first and we’re behind them and we tried so hard and we got second half, we got the goal and tied it up. And then in overtime we scored one other goal and we beat the team. Jason: Did you feel that way with your English ability, like you sort of came from behind? Like you got here and everyone was ahead of you? Kosuke: I came from Japan and all that and all the hard work, and got to college and played four years there and I didn’t know what’s going to happen. I didn’t know I’m gonna go professional and I just keep pushing myself hard. I got drafted, play for Rapids, and it’s been really tough. My team struggle a lot, but in four years, we came through and that’s to me just come from behind. Jason: Can I get you to give me a high five and say, “English, baby!” in the air? When Kosuke Kimura came to college in the US, he knew very little English. His coach told him that he could not speak any Japanese if he wanted to play soccer. It was difficult, but Kosuke did it and he learned English quickly. Most of Kosuke’s classmates knew more English than him. He had to catch up to them. In the championship game last season, Kosuke’s team, the Colorado Rapids, had to catch up to their opponents too. They were losing early in the game, but won in a come from behind victory. Have you ever come from behind to win something? Can you think of a time when you had to catch up to others? For more with Kosuke, see the second half of this interview or visit our blog. Good English. Almost no accent. I want be like him, soon as possible. It takes me one year to catch up with my programming studies but at the end I could make it. So I think almost everything in life is reachable with enough effort. it happen some time . as a teacher, i should say he is a good student, if he want do something, then he can do it well. because he believe himself he can do it. so should we. like the AD, nothing is impossible. we must have the confidence . When I was the second grade in the elementary school, I was really terrible at Math. The minute my mom realized that, she made me go to an institute for learning Math. She thought I had to catch up with others. At the first time, I was losing compared with other students, but finally, I got a come from behind score on the math test the next year. It was 100 points! I was so happy, and my mom too! I think the whole time we come back to pay to get something thatwe set a goal well ahead in terms of the day get to achieve amean catch up with everything around us.